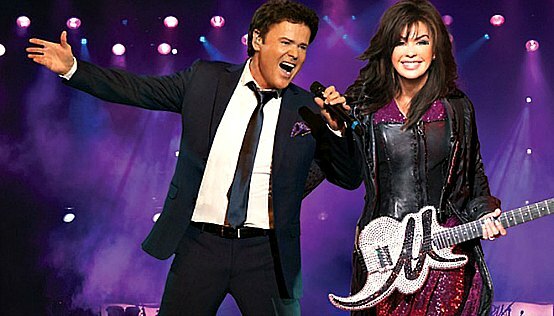 The Donny and Marie Osmond Las Vegas show is a refreshing look backward and forward in time of two very talented artists who are quite familiar with the glitz of a Sin City stage production. The Donnie and Marie Las Vegas show has many highlights and memorable moments that guests will experience in this 90-minute event. The show opens with a rowdy rendition of Get the Party Started, Knock on Wood and an energized version of Dancing in the Streets which is followed by the duets new song Vegas Love. There is plenty of flash and flare which highlights the professionalism of Donny and Marie some forty years after first appearing on the Strip. The choreography includes television video clips of the two performing at a young age on the Andy Williams Show to confetti showering the crowd to incredible wardrobes. The revue also features plenty of solo time for each artist with Marie going a bit country at first which leads to Paper Roses. She continues with a blissful operatic tone while singing Pie Jesu and spices things up with an innovative hipster performance of Walk this Way. Marie closes her set with a rocking upbeat version of These Boots Were Made for Walking. The choreography during her set ranges from video screens to a troupe of male dancers to her playing guitar to wearing a sparkling wardrobe worthy of Sin City. When Donny returns for his solo session the stage is engulfed with smoke while he performs his hit single Soldier of Love. From here he may play one of a couple of songs from his days with the Osmond Brothers like a highly choreographed Crazy Horses or perhaps a hip hop version of Yo Yo. Donny is quite proud to point out that he won the competition on Dancing With the Stars and he has no problem keeping up with his younger dance troupe that are performing scintillating dance moves. Donny closes his solo portion with Puppy Love, his hit single that propelled him into a heartthrob. The show is complete with an ending that includes the brother and sister duet singing their classic hits Deep Purple, Make the World Go Away as well as Morning Side of the Mountain. The Donny and Marie Osmond show is enhanced by their intimate showroom that seats 700 guests within the Flamingo Hotel and Casino. The duo interacts with the audience from the start and perhaps you can get a lipstick red kiss from Marie or Donny might sit on your seat or lap. The interaction and showmanship of the duo combined with the fabulous choreography that includes several wardrobe changes, multimedia effects as well as funny monologues certainly distracts patrons from the old-school interior décor of the showroom. The Donnie and Marie Osmond Las Vegas show is one of those must see events for no other reason than to witness two of the most polished Las Vegas entertainers of all time. From an early age of performing on the Strip as a duet as well as with the Osmond Family and Brothers these two performers have honed their skills of glitz that appeals to many ages. Donnie and Marie Osmond Las Vegas have been performing together in Las Vegas since the 1970s. First as youngsters with their family, Donny and Marie have always been able to complement each other on stage during their duo and solo performances. Their appearance on the Andy Williams Show propelled them forward in stardom. Donny broke on the scene with the Osmond Family as well as his brothers. He quickly became the next heartthrob of women young and old. Marie went solo and found the roads of country music called her name. The two consummate performers have also hosted their very own primetime television variety show which entertained audiences with choreographed dances, witty monologue and plenty of music. In 2008, the brother and sister act started performing headliner engagement shows on the Strip once again. After several hit recordings to numerous albums to world tours to television the dynamic duet is back in Las Vegas and doing what they love to do. The Donny and Marie Showroom located within the Flamingo Hotel and Casino hosts this family friendly event. This intimate venue has a seating capacity of 700 guests with a variety of options from tables to booths. Guests are encouraged to meet new friends with this type of seating configuration. The show plays Tuesday through Saturday at 7:30 P.M. with a minimum age of eight years old to attend. Donny And Marie Tickets are on sale now with a great VIP opportunity to personally meet the duo.